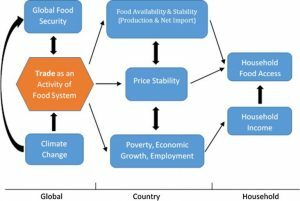 Do markets and trade help or hurt the global food system adapt to climate change? Rapidly expanding global trade in the past three decades has lifted millions of people out of poverty. But trade has also reduced manufacturing wages in high income countries and made entire industries uncompetitive in some communities, giving rise to nationalist politics that seek to stop or reverse further trade expansion in the United States and Europe. Given complex and uncertain political support for trade, how might changes in trade policy affect the global food system’s ability to adapt to climate change? The authors for the new Food Policy paper "Do markets and trade help or hurt the global food system adapt to climate change?" argue that the best way to understand food security in a changing climate is by looking at it as a double exposure: the exposure of people and processes to both economic and climate-related shocks and stressors. Trade can help us adapt to climate change, or not. If trade restrictions proliferate, double exposure to both a rapidly changing climate and volatile markets will likely jeopardize the food security of millions. A changing climate will present both opportunities and challenges for the global food system, and adapting to its many impacts will affect food availability, food access, food utilization and food security stability for the poorest people across the world. Global trade can continue to play a central role in assuring that global food system adapts to a changing climate. This potential will only be realized, however, if trade is managed in ways that maximize the benefits of broadened access to new markets while minimizing the risks of increased exposure to international competition and market volatility. For regions like Africa, for example, enhanced transportation networks combined with greater national reserves of cash and enhanced social safety nets could reduce the impact of ‘double exposure’ on food security. The paper can be accessed online and downloaded in pdf from this page. This article was originally posted on PIM Webpage.